Film Independent Spirit Awards Announce 2017 Grant Winners! For most Angelinos, the threat of torrential downpour is usually seized upon as the perfect excuse to snuggle indoors with a hot cup of Soylent and a pile of awards screeners. But not so this past Saturday in West Hollywood, where the promise of creative camaraderie, gourmet eggs Benedict and $75,000 in unrestricted filmmaker grants were more than enough to lure this year’s most accomplished and acclaimed visual storytellers to the BOA Steakhouse on Sunset for Film Independent’s annual Spirit Awards Nominee Brunch. But despite temperatures dipping into the intimidating 50-degree range, this year’s Spirit Award nominees were undeterred, arriving eagerly to eat, drink, rub bespoke shoulders and celebrate a year that, despite whatever other horrors plagued the world IRL, was nevertheless a pretty damn good one for the movies—a fact that managed to spark optimism among Saturday’s attendees despite the gloomy forecast (weather and otherwise). But Saturday’s brunch wasn’t just about giving A-listers the chance to swap war stories over rectangular plates loaded up with exquisitely seasoned potato fritata. It was also a chance to hand out $75,000 in unrestricted filmmaker grants to up-and-coming creators, presented by brunch co-hosts Sterling K. Brown (The Story of Us, The People vs. O.J. 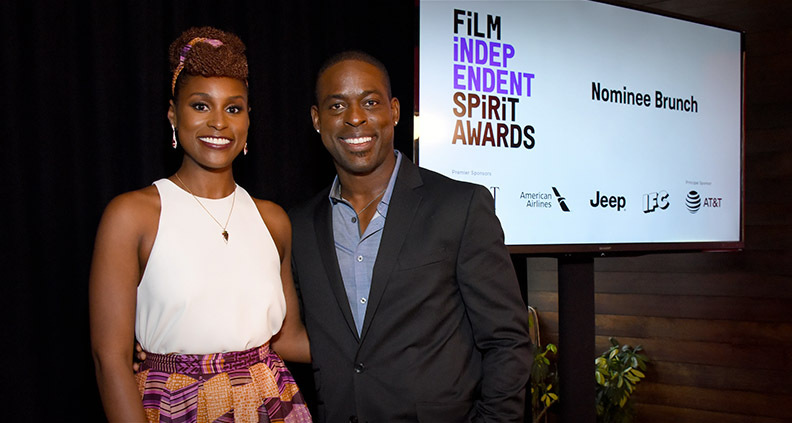 Simpson) and Issa Rae (Adventures of Awkward Black Girl, Insecure) in a brief ceremony introduced by Film Independent President Josh Welsh. Jordana Mollick (Hello My Name is Doris, Life Partners) received the Piaget Producers Award, honoring emerging producers who despite limited resources have demonstrated the “creativity, tenacity and vision required to produce quality independent films.” Celebrating its 20th year, the annual award includes a $25,000 unrestricted grant funded—for the 10th year—by Piaget. Finalists included Lisa Kjerulff and Melody C. Roscher & Craig Shilowich. The Kiehl’s Someone to Watch Award was awarded to The Fits director Anna Rose Holmer. The award recognizes “talented filmmakers of singular vision” who have not yet received appropriate recognition. In its 23rd year, the grant includes a $25,000 unrestricted grant funded by Kiehl’s Since 1851. Finalists for the award included Spa Night director Andrew Ahn, Embers director Claire Carré and Ingrid Jungermann, director of Women Who Kill. The Truer Than Fiction Award, presented to “an emerging director of nonfiction film who has not yet received significant recognition” was given to Nanfu Wang, director of Hooligan Sparrow. Now in its 22nd year, the award includes (you guessed it!) a $25,000 unrestricted filmmaker grant. Finalists for the award included Solitary director Kristi Jacobsen and Kiki director Sara Jordenö. Hosted by champion side-splitters Nick Kroll and John Mulaney, the 2017 Film Independent Sprit Awards will be held Saturday, February 25 on the beach in Santa Monica and broadcast exclusively LIVE on IFC at 2:00pm PT / 5:00pm ET. For more information about the Sprit Awards, click here and subscribe to our YouTube channel to watch speeches and highlights (also: Twitter, Facebook and Instagram). Not a Member of Film Independent yet? Become one today.